Read about various volleyball passing techniques. We should try to pass the ball in front of our hips, have a well balanced position and our both feet on the ground, right? However, knowing only this “standard” passing form isn’t enough. There are other passing techniques we should learn about. Place your feet a little bit wider than your shoulders. Drop your hips closer to the ground by bending your knees. Shift your weight on the ball of your feet - if the weight is totally on the heels you may find it difficult to move quickly. When preparing to pass (or to play defense) keep your arms unattached. Keep your arms bent in around 90-145 degree angle. Place your arms/hands somewhere “half way” - between bumping and setting position. Then you are able react quickly and either pass the ball with fingers overhead or bump it with forearms. Do not tie your arms together to bump the ball because you may have to pass by overhead setting. In the higher position, keep your legs only slightly bent. You will most likely use this technique to pass floaters, since you have to pass the ball, which flies horizontally. 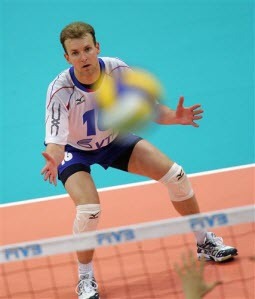 When the ball floats, it travels high "straight forward" and usually doesn't "pull down" as rapidly as a top spin serve. So when the ball travels "straight forward" you have to “move in front of the ball”, most likely you can’t get “under the floater”. Bend your knees and drop your hips toward the ground. You will be in a very deep squatting position. You may use this technique to pass top spin serves, like jump serves. The top spin pulls down the ball rapidly therefore the serve receiver needs to get very much “under the ball” to be able to pass it. Pay attention to arms: your arm position may change when bumping the ball. When passing receiving a top spin serve or a very short serve, notice the arms may be placed "parallel to the ground level" - your platform may point "toward the sealing" since you have to get "under the ball" and pass the ball "up". (Look at the 2nd picture on the right). Compare the pictures and you get the idea how the arm platform angle changes. Notice also how in the other picture the ball is not passed in front of the hips, but on the side. Volleyball Passing Techniques - How to Pass When the Ball is Outside the Perfect Passing Range? Players need to be able to contact the ball also on the right or left side. 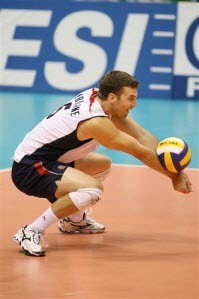 In modern volleyball serves have become so powerful that players simply don’t have enough time to move under the ball. It is crucial to learn to pass the ball all around the body. Especially on the beach volleyball court, where overhead passing with fingers is not allowed, but also indoors players need to be able to pass an extremely high flying ball with the forearm pass - in addition to overhead pass with fingers. When passing a high ball on the side the player turns toward the sideline. The player may need to take a step backwards with the right foot when turning to the right – or with the left foot when turning to the left. One of the most common volleyball passing techniques is when the player places the knee on the ground while passing the ball. In order to get under the ball a player may need to drop the hips very close to the ground and place the knee on the ground. On the left side the player may drop the right knee on the ground - and on the right side the left one. Overhead passing is used to pass i.e. floaters which travel on the head level or above the head. Some players like to pass short serves with the overhead passing. Try to contact the ball in front of your face or above your forehead. The technique is slightly different than in setting. You fingers and upper body need to be “more flexed” when compared to setting. You need to use "more strength" in overhead serve receive vs. setting, so the ball doesn't come through your hands. The touch is not so soft, but kind of rough. How to practice these volleyball passing techniques? When teaching these volleyball passing techniques to players it is important to practice them one at the time and pay lots of attention to each technique. Otherwise players use only techniques they are the most comfortable with and never learn to use different techniques in the match.